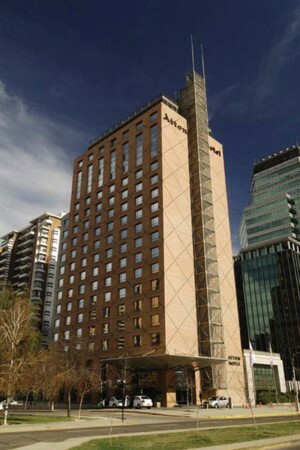 Atton El Bosque Hotel opened in 2007. It is located a short walking distance from Tobalaba subway station, in the heart of El Golf suburb in Las Condes. Guests can find some of the best restaurants and the most important business centers in this area. It is also close to Costanera Center, Los Leones Golf Club, and Parque Arauco Mall. Nearby are San Cristobal Hill and Santa Lucia Hill, two favorite spots that provide unsurpassed views of Santiago. The hotel itself is a modern 18-story building with 240 rooms with thermo-acoustic panel windows for excellent sound-proofing. There are also connecting and ADA rooms available, and non-smoking floors. Each room is decorated in a contemporary style. The average room size is 96 square feet, furnished with two queen beds or one king bed. The Junior Suite has a comfortable living room and a king bed. All rooms are fully-equipped with cable television, writing desk and an ample safe. In addition all rooms have: High-speed cable internet access, international direct-dialing telephone, minibar, air-conditioning and heating with individual temperature controls, safe and hair dryer.